Theri Story is awesome, thrilling and gripping. Home/NEWS/Theri Story is awesome, thrilling and gripping. 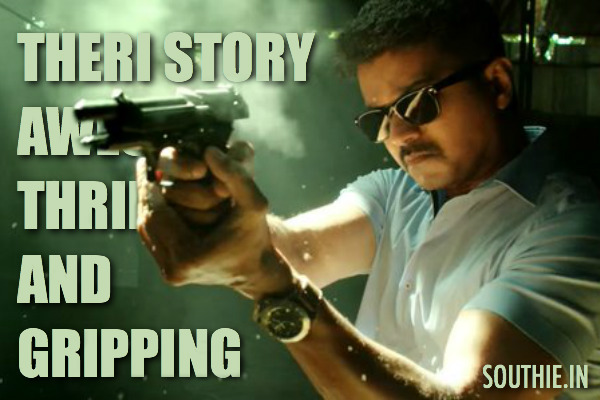 Theri Story is awesome, thrilling and gripping. Theri is said to be a modern take on Vijaykanth’s Kshathriyan, which was written and produced by Mani Rathnam. Theri is a story of a cop, his daughter, and how things pan out for them. Theri is said to be a modern tale on Vijaykanth’s Ksathriyan which was penned and produced by Mani rathnam himself. Atlee has apparently taken the rights of the movie to give his take on it. Theri story would be very similar to what you see below. Panneer Selvam (Vijayakanth) would be Vijay Kumar – Thalapathy Vijay, an honest cop, gathers enough evidence against a local goon Arumai Nayagam a.k.a. Annachi (Thilakan). Annachi is sent to prison. Annachi avenges his arrest by killing Panneer Selvam’s wife (Revathi) . His wife would be played by Samantha. Meanwhile, Arumai Nayagam is released from the prison and realizes that he doesn’t carry the same respect as he used to before going to jail. His anger against Panneer Selvam doesn’t cease. Arumai Nayagam challenges Panneer Selvam to join the police again and try to fight him again. Panneer Selvam initially rejects the offer. Arumai Nayagam tries to provoke Panneer Selvam by attacking his home and son. Out of frustration over son’s attack, Panneer Selvam joins the Police again and fights Arumai Nayagam again. ACP Panner Selvam’s fight against Arumai Nayagam forms the rest of the plot.